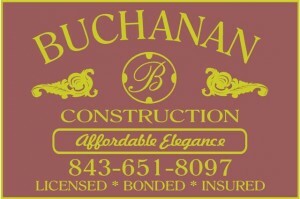 Buchanan Construction builds affordable elegance. Through his dedication and hands-on style, Jim Buchanan has built a reputation for creating affordable, elegant homes in prestigious communities along South Carolina’s Grand Strand. Some of his finest work can be seen in the communities of Creek Harbour, Creek Ridge, and Plantation Lakes. Jim’s home designs are very detailed and have no wasted space. Buchanan homes include many standard features that most homebuyers would consider upgrades. Jim puts the same materials, elegance, and dedication into your new home as he has done in building his own home. Become a homeowner with Buchanan Construction and experience built-in quality and affordable elegance..
View the many galleries of finished custom built Buchanan luxury homes in the Grandstrand Coastal areas. Hear and view what our home owners say about building with Buchanan Construction and the dedication that Jim the owner provides.